The ported blade gate valve is the answer to industries where abrasive slurries, corrosive and/or scalling liquids are of great concern ensuring that leakproof sealing is obtained. The ported blade is always in contact with the replaceable reinforced insert seal rings on both sides. This prevents any possible build up of material, damage to the blade and seal rings. In the open position the ported blade guarantees an unrestricted flow path thus minimizing turbulence and wear. In the closed position the blade acts as a blind and is sealed between the two seal rings. The port is positioned in the lower body extension. The lower body extension with increased clearance, flushing points and removable door, allows material to be flushed or drained. 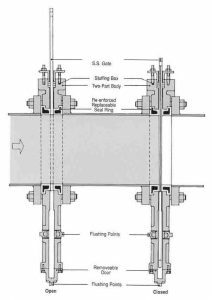 The upper valve section is sealed to atmosphere by means of a stuffing box. A tube and bellows provide spindle protection.